In June of 2005, 23-year-old Dustin Rozmenoski of Black River Falls was killed in a motorcycle accident. Despite the tragic loss, Dustin&apos;s mother, Mary Jo, says his death helped save several other lives. That&apos;s because Dustin indicated he wanted to be an organ donor on his driver&apos;s license and told his family about the choice. Mary Jo Rozmenoski says doctors approached the family about donating Dustin&apos;s organs after the accident. Because he&apos;d made his wishes known, she says there was no question about what to do. Dustin was able to donate five live-saving organs so that other people could live. In the two years after his death, Mary Jo has traveled the country sharing Dustin&apos;s story. She wants people to understand the importance of talking with their families about whether or not they want to be an organ donor. She says time is often very short when a person is near death, and doctors can&apos;t delay. 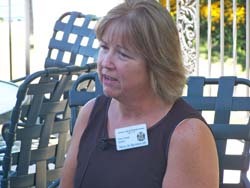 Mary Jo spoke Friday to recipients of the state&apos;s annual Gift of Life Medal, which honors individuals who have donated organs in the past year.